Have you ever wondered what Tai Ji Quan (TJQ) is? Last Tuesday, I joined Mailee, Program Coordinator at WellShare International, in one of the classes she teaches. In order to teach this course, Mailee and other WellShare staff have received training from the Metropolitan Area Agency on Aging. 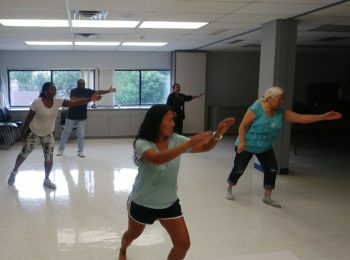 In the 48-session (24-week) course participants learn a series of choreographed movements, twice a week for one hour. This picture shows Mailee (front) and participants of the class last Tuesday. If you want to learn more about Tai Ji Quan, click here. This activity is made possible by a grant from the Eliminating Health Disparities Initiative (EHDI) of the Minnesota Department of Health’s Center for Health Equity, through an appropriation from the Minnesota State Legislature.